This post was written by Lesley Parilla, database manager and cataloger for the Field Book Project. What is a library to do when it has fabulous materials to share with users, but making library records for each item requires significantly more time than a typical collection? This was the challenge of the Russell E. Train Africana collection. It contained materials with both broad public appeal and significant historical value, however content and formats varied widely. The library wanted to create records in the predominant library and archival description standards to assure that materials would be discovered by as wide an audience as possible. By using the library and archive standards, records could easily be shared across online platforms. The Libraries decided to pursue a short term project to see if they could determine a solution to these challenges. 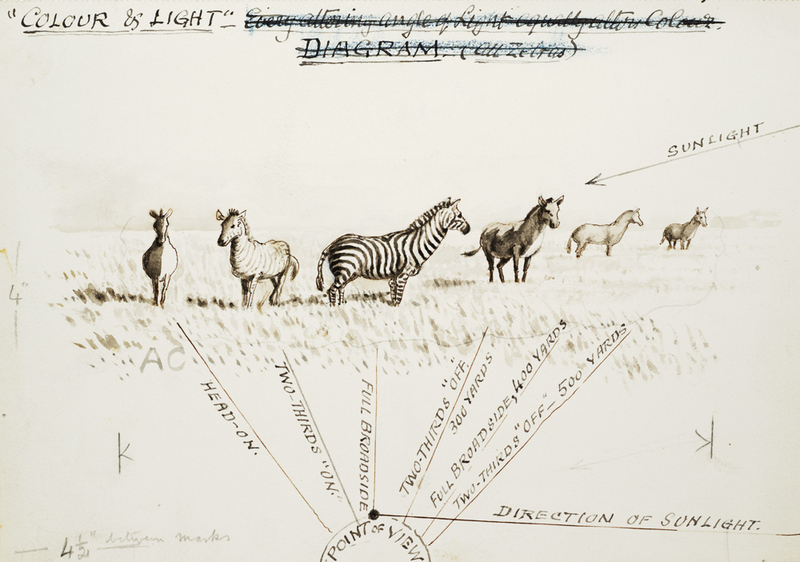 In 2004, Smithsonian Libraries acquired the Russell E. Train Africana Collection, now housed in the Joseph F. Cullman 3rd Library of Natural History. The library wanted item level records for the entire collection. Staff catalogers cataloged the 1500 publications using the regular workflow, but the archival materials proved problematic. They were in a wide variety of formats and content was sometimes unclear, for reasons as simple as undecipherable handwriting. Original cataloging these items proved incredibly time consuming. The collection arrived with a detailed inventory, created for Russell E. Train. Smithsonian Libraries had the inventory converted into an Access database in 2008. They decided to pursue a short term project to see if this database could be converted to the desired item level records in the library description standard MARC. During initial investigations, staff realized that MARC records were possible, as well as an online finding aid in the archival description standard EAD. We determined decisions would be made with four priorities in mind: how to best utilize the existing description, what standards to use, where to contribute the descriptive content, and how to make the records sustainable. Since this was a short term project, we needed to make sure that records could be maintained in the same manner as all other records and not require special attention in the future. MARC is short for Machine Readable Cataloging. It was developed in the 1960’s by Henriette D. Avram, while working at the Library of Congress and “replaced ink-on-paper card catalogs and revolutionized cataloging systems at libraries worldwide” (Library of Congress). This has been the library description standard for decades. MARC records are what make library online catalogs possible. To learn more, check out Library of Congress’ MARC website. EAD is short for Encoded Archival Description. It is an XML schema initially created in the 1990’s to enable archivists to encode findings aids and make them searchable in the online environment. It now maintained by Society of American Archivists and Library of Congress. To learn more, check out Library of Congress’s official EAD site. Through discussions with staff and online research we discovered an open source program that has existed since 1999 and widely used by libraries called MARCEdit. This program was key to important steps in the conversion process. MARCEdit has the ability to convert tab-delimited files (e.g. spreadsheets) into MARC as well as other schema. 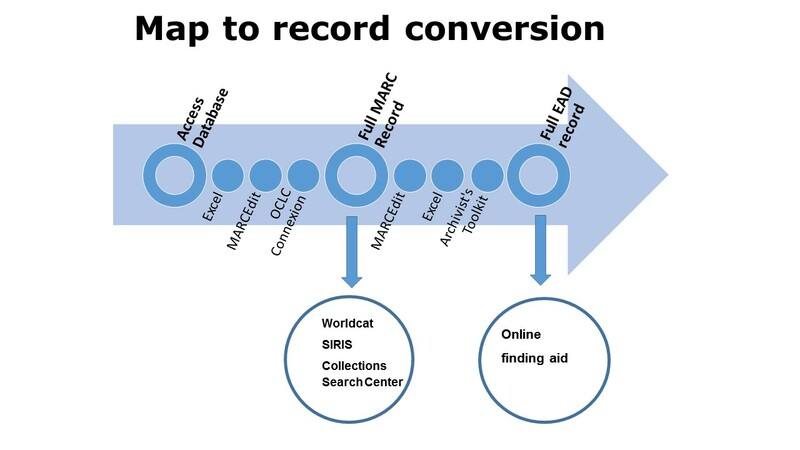 This meant that if we could get the description in a spreadsheet to a determined standard, we could convert the records and upload them to OCLC Connexion, which would put the records in the regular cataloging workflow. At this point we would have records that could be treated like any other. Resulting records do not completely meet one standard of cataloging. We worked with staff with expertise in MARC and EAD to determine what description needed to be standardized and what could be left as is. With their input, we were able to determine that we should focus on standardizing: dates, controlled subject fields (Library of Congress subject headings), formats, as well as names of individuals, organizations, and publications. The results are records consistent in content and structure, designed with searchability in mind. With help from staff across the department, we converted pre-existing, donor supplied description to create records in the prevailing Library and Archives description standards with software already used and supported by the Smithsonian Institution. We were able to create item level records for archival materials in a fraction of the time it would have taken to original catalog. Nearly the entire collection now has item level records available online. By using the existing description with the input of staff with extensive knowledge of MARC and EAD, we were able to make the most of existing description and minimize editing. There was a surprising additional benefit. By converting the records in MARC format, Diane Shaw, the special collections cataloger, was able to better leverage her time and expertise to enhance the item description. She individually edited and augmented the records more than we had initially thought possible in the timeline, resulting in increased discoverability. Thanks to all the staff that made this project possible! Previous Post #FantasticObjects Tweet Up with National Museum of American History!